The CDI5* event on Feb. 4-6 will be the first meeting of the three top combinations since the German and Dutch women were runners up to Steffen and Ravel at the World Cup in Las Vegas last April. Other riders may qualify through a CDI3* a week before the event, or receive an invitation. 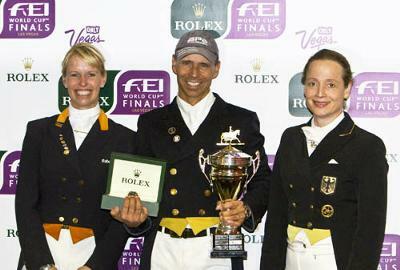 Tickets will go on sale at noon Monday, at www.equestriansport.com. The World Dressage Masters at the Palm Beach International Equestrian Center is the first of at least three of the globe’s richest dressage events held in the U.S. and Europe in 2010. A fourth venue is likely to be added. Anky lives in Erp, The Netherlands, and is married to the Dutch national coach, Sjef Janssen. They have two children. She has won nine World Cups, five on Bonfire and four on Salinero, three Olympic individual gold medals and two individual World Championship gold medals. Isabell Werth has won four Olympic team and one individual gold medals, three World Championship team and one individual gold medals and two World Cup titles. She returned to competition the week after Christmas after a six-month break during which she gave birth to a baby boy, Frederik. Despite the long break, she had accumulated so many points in six months of competition that she entered 2010 with both Satchmo and her other top horse, Warum Nicht FRH, in the top 10 in the FEI World Rankings that spans a year of shows. The World Dressage Masters is a sports and marketing initiative of equestrian innovator Exquis, international sports marketing agency, SportBizz, and Equestrian Sport Productions of the USA. WDM utilizes marketing strategies and innovation to enhance the sport of dressage worldwide and is sponsored by Exquis, Moorland Stables and Moorland Investments, Nürnberger Versicherungsgruppe and Jerich International.